Associate Professor, Teaching Stream, Michelle Craig is a recipient of the Faculty of Arts & Science Outstanding Teaching Award. Established in 1993, the awards highlight excellence in teaching. Recipients are selected based on nominations by peers and students. Michelle Craig is known for her tremendous openness, patience and her commitment to creating a welcoming and effective learning environment for her students. In the words of one student: “Through her teaching and mentorship, she has encouraged and enabled me to reach my full potential both academically and beyond the classroom. 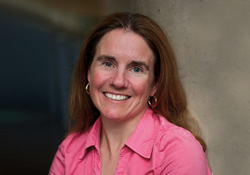 She is a huge part of my sense of belonging to, and loyalty towards, our university community, and I am convinced that she has had a similar impact on many of my fellow students.” She is also highly-regarded for incorporating evidence-based pedagogical approaches into her classroom and her work in course design. Long before the “flipped classroom” was in wide use, Craig was incorporating active learning into her teaching. She was, for example, the first in computer science to move students out of the “chalk and talk” tutorials and into computing labs, where they could work on solving real problems in real time. Read the full story about this year's Outstanding Achievement Awards at Arts & Science News.